Enjoy the ultimate Caribbean experience with our 10 nights All Inclusive holiday to the stunning Bahamas. With crystal clear turquoise waters gently lapping the shores of white beaches. Relax and sink your toes into the powdery sand and let your cares drift away. ‘Commonwealth of The Bahamas’ as it is officially known, is made up of over 3,000 islands, cays and isles. Boasting some of the clearest waters as attested to by astronauts from space, the islands attest to approximately 340 gorgeous sunny days a year! Our resort is based on New Providence Island with its taste of the tropics and a touch of glamour with it being close to the capital, Nassau. Let your imagination take you away as you spread out and chill out on a sunbed or try a new activity in the lush surrounds of our hotel. Climb to new heights on the rock climbing wall or dive for the ball with a spot of beach volleyball on land while the blue waters are ours to explore in a kayak or feel the wind in our faces on a Hobie Cat or during a windsurfing lesson. As the sun goes down, you can dance to the latest hits at the disco or have a nightcap in the Piano Bar. Alternatively, put your glad rags on and head to one of the nearby casinos for a flutter or two. Leave your cares behind as you head underneath the calm waters in a submarine as you visit SeaGardens Marine Park with its intricate coral formations, teeming with colourful fish. If your prefer to keep your feet on dry land then explore the historic city of Nassau and its old fort, Governor’s Mansion and the famous Straw Market where you can shop for souvenirs such as bags, straw hats and carvings. Practice your negotiating skills for a bargain! 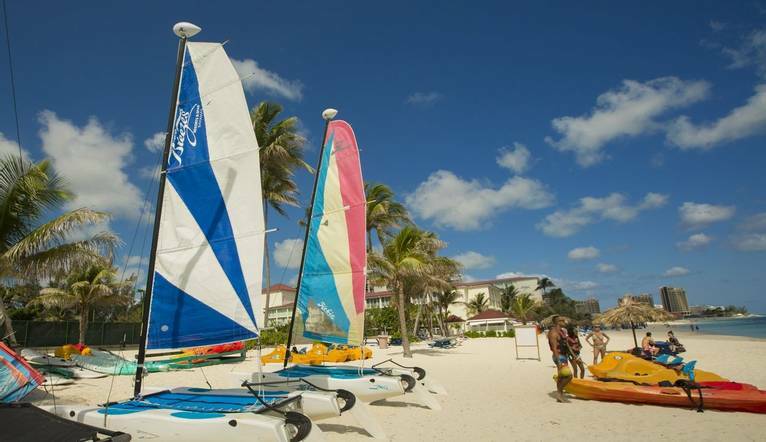 Found on the powdery white sands of the famous Cable Beach, our hotel is in a prime location for relaxation and activities in resort as well as heading to the world class casinos and shopping in Nassau. 3 restaurants, a pool grill and 4 bars will keep us fed and watered, while the fitness centre and the many daily activities on offer include rock climbing wall, beach and pool volleyball as well as tennis are there to keep us active. Staying wet is easy with the swimming pool or the range of watersports. Our Garden View rooms all feature air-conditioning, TV, CD player, telephone, tea/coffee- making facilities, hairdryer, iron and safe. Ocean view rooms are available at a supplement. The transfer time between Bahamas Airport and the Breezes Bahamas is approximately 15 - 20 minutes. There are several optional tours, which may be on offer during your stay. Full details of these tours will be given at your Information Meeting. Please remember prices may vary, according to numbers. You may pay for the tours in Dollars in cash only. Your Tour Leader will help arrange these for you but may not necessarily accompany you. Swimwear is considered suitable for the beach and poolside only, so a robe/cover-up would be useful. Ladies are advised to be a little careful about what they wear outside the hotel - short shorts and skimpy T-shirts are not recommended and may attract unwanted attention. Summer clothing is worn all year. Generally speaking social life is smart casual to casual. Suggest taking an umbrella and a torch (for frequent power cuts! ).